Large heavy rectangular textile, cut on all sides, of brocaded plain compound twill weave silk. The fabric has two warps and two wefts. The warps are white and red, and the wefts are silver and white. The ground of the face is made by the silver wefts, which are held in place by the white warps. 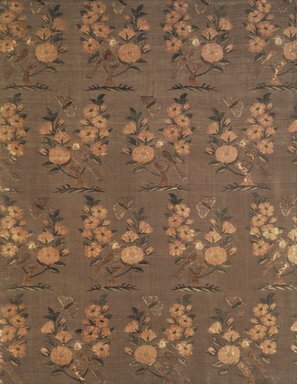 The textile is brocaded with a large rosebush, bird and butterfly group arranged in drop repeat, done in red, yellow, green and dark blue silk and gilt threads. The brocading is bound down in twill by the red inner warp, which thus appears on the surface. This warp never appears on the back, which is white twill, save on the brocaded areas, which are covered by floats of the silver weft. The diagonal lines of the twill run on the face from the lower right to the upper left. A few of the silver weft threads are broken, and the red brocading and the red warps are worn away on a number of places, revealing the white warps and wefts in twill weave beneath. The textile is mounted on a board placed on wooden frames and glazed.